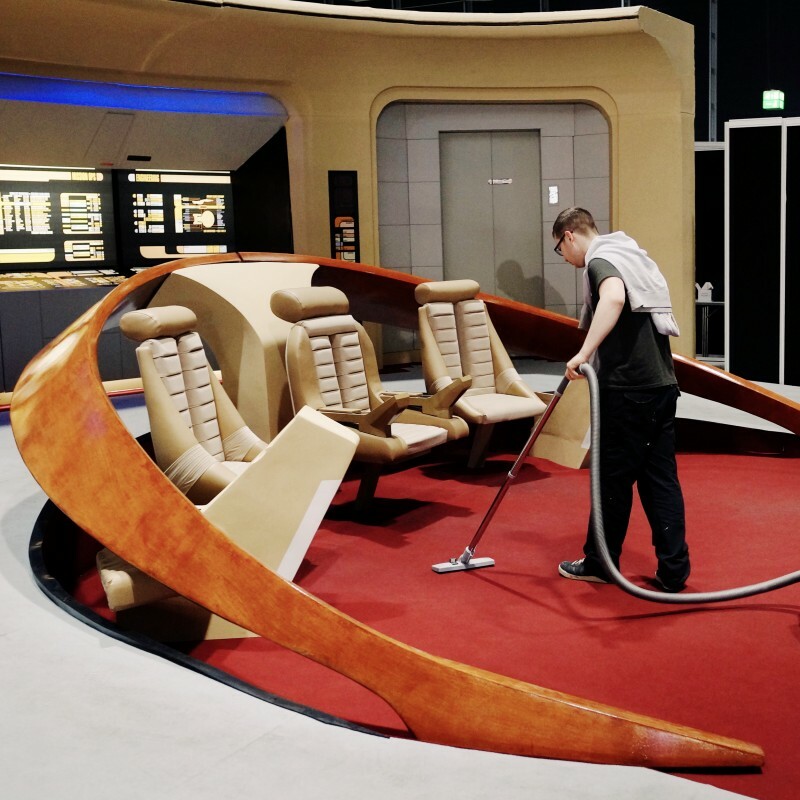 Have you wondered how the Enterprise is cleaned in the 24th century? Three possible solutions for eliminating housework by automation. Is this a male cleaning android operating a vacuum cleaner on the Enterprise D bridge? 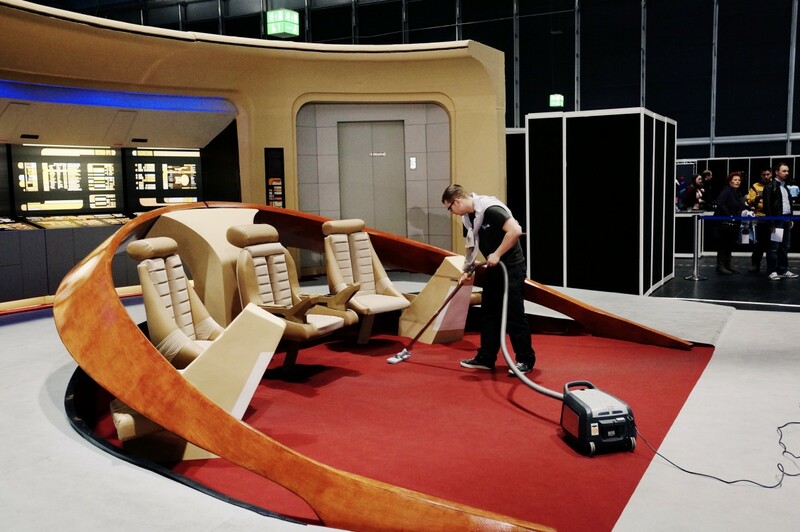 Hi, a funny moment at the Destination Star Trek convention was watching how the Enterprise D bridge was cleaned :P Cleaning the ship is something we do not normally see in sci-fi movies. But why is this so? 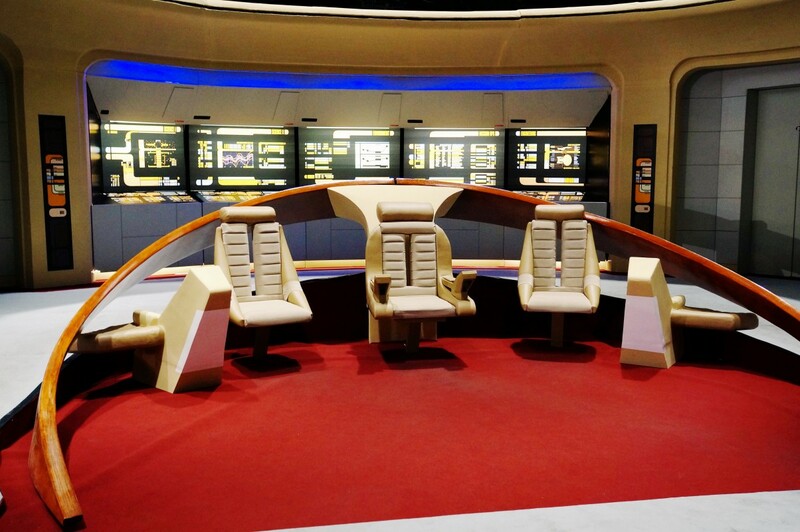 Have we finally got rid of household chores in the 24th century? The first scenario is to automate the cleaning chores by a number of dedicated cleaning machines or robots which are optimized for a single task only such as washing the dishes or cleaning the floor. Such machinery already exist in some form today. The former are called dishwashers, the latter could be automated self-running vacuum cleaners like the home robots offered by iRobot for example. The next step will be to have general-purpose robots or personal androids at home that look like humans and are capable of doing a number of different tasks such as assisting in the kitchen or cleaning the household for us. Sounds creepy, doesn't it? But if we can get used to Data, why not get used to a cleaning android as well? The third solution is to integrate the cleaning function right into the structure. This starts from building anti-dirt coated surfaces and goes to integrating some cleaning mechanism right into the building. Of course above solutions complement each other and can depend on the requirements and properties of the area which has to be cleaned. How do you think will the future of housework look like? Who (or what) will do our chores? When will manual housework become history?